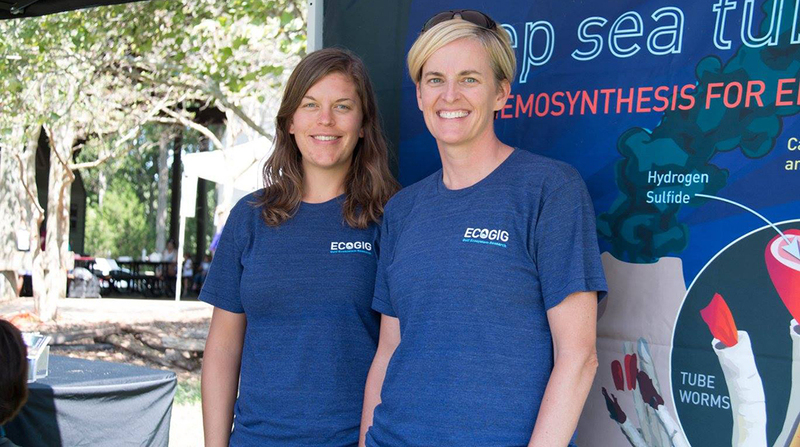 ECOGIG outreach office staff Emily Davenport & Sara Beresford, in front of our newest informational sidewall - deep sea tube worms!!! Photo courtesy of Athens Clarke County. Water organizations came together to make water fun! Visitors got to touch sea life, become a water drop, or create a water delivery system. With open-ended activities, participants of all ages enjoyed the activities at the festival. ECOGIG brought the Ocean Discovery Zone - visitors enjoyed building and learning about deep sea corals and driving a model version of a ROV (remotely operated vehicle). The outreach office also debuted our newest informational sidewall all about... deep sea tube worms!! Visitors learned that tube worms have no mouth, they rely on symbiotic bacteria in their stomachs to produce their food, and they built a deep sea tube worm puppet to take home with them! Check out some of the other organizations that were involved in the Water Festival. You can also see a bunch of photos from the event on facebook!! Keep Athens-Clarke County Beautiful: Our gutters lead straight to the river. Help keep them clean! Sandy Creek Nature Center: Everybody poops! We flush it down the toilet. Discover what animals do with their waste. ECOGOG: Explore the Ocean Discovery Zone using a model ROV, build a sea coral, or learn about tube worms. UGA EcoReach: Discover the Amazing Underwater Tape of the Caddisfly, a true superhero of the steam. Waterhshed UGA & Meet our aquatic swimming mates...the macroinvertebrates! Find out how they keep our water clean. UGAquaponics: Learn about aquaponics and how it can be used to grow life. UGA Water Resource Team: To flush or not to flush, that is the question. Test your flushing knowledge. UGA Environmental Health Science Club: Test your eyesight as you hunt for microbes in the water. Create a Sewer Hero costume, play with Athens Area Humane Society puppies, pick up some goodies, and more! Most water festival activities met the Georgia Performance Standards in science!